For whatever reason, my alarm decided not to go off this morning, but thankfully due to the light coming under my door and my relative lack of sleep during the second half of the night, I was able to rest myself out of bed and stumble into the living area. Once I noticed that everyone else that was up was dressed, and I was still in my pajamas, I dipped back into my stateroom to change into some real clothes. Breakfast for me was a bowl of Honey Nut Cheerios, except with some powdered milk. I added the water, mixed it up, and poured it in, and ate. It didn’t taste like milk, but it didn’t taste like water, so that was fine by me. The crew was pretty spread on breakfast foods, although the granola cereal did have a couple of takers. I was ready for a long day, so I made sure to also drink a lot of water. We had a quick morning meeting as a crew, and then it was off to work. I went with Darrel and Carla to take care of business in the Green Hab first. This recycles our waste water into what we affectionately know as “grey water,” which we then use mostly for flushing the toilet. It saves a ton of water, but a better system would be needed before we could actually consume that water, for example. We pumped water from the Grey Water Storage tank into the actual Green Hab, which then allows it to be filtered through strainers and various types of bacteria to remove most of the impurities so that we can use it. This normally has to be done once or twice a day in order to have an operational toilet. Exciting stuff, huh? After that, I got to ride the ATVs! Luís helped orient Carla, Darrel, and myself on their usage and the discrepancies between the three workable rovers (aptly named Viking I, Spirit, and Opportunity). Viking I was by far my favorite, if only for the fact that it’s a little finicky to use and start up. 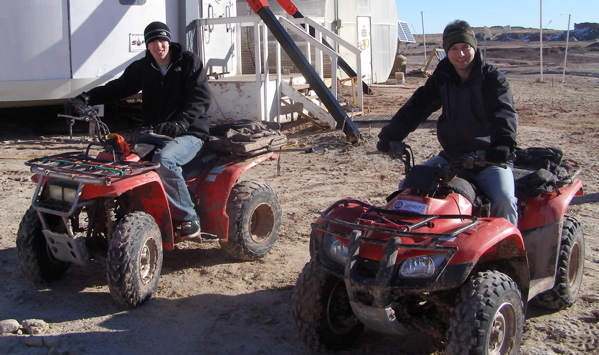 There is also a fourth rover, Viking II, that Darrel and Luís (and to some extent, me) worked on getting up to speed, at least until was served. I also discussed the repairs necessary to elevate the radio telescope up to twenty feet (the height necessary for optimal observing of Jupiter) with Brian and Darrel. The crew is planning on completing these repairs completely “in sim,” i.e. in spacesuits with airlock egress/ingress, which should be an experience. Crew 88 started the construction and repairs of the radio telescope in sim, but due to the amount of EVAs they would need, they decided to complete what work they could out of sim. For us, we will only need three EVAs max to complete everything, which isn’t that bad. Our afternoon agenda consisted of introductory EVAs for the entire crew. Brian, Carla, and Luís went out first, with myself, Kiri, and Darrel making up the second team about an hour after they returned. 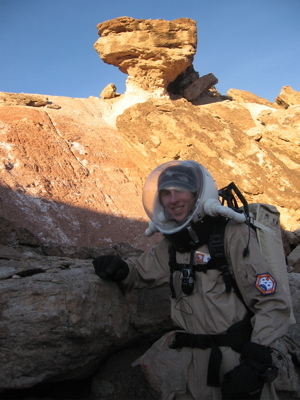 Our team trekked to the base of Olympus Mons, a large, relatively isolated hill about a half-mile north of the Hab. We stopped a couple times on our way out for pictures, so we could have made it further up the hill, but once we got to the base our HabCom called the thirty-minute mark. We snapped a few final shots, then started walking back to the Hab (we got back in about fifteen minutes). Both at the start and the end of the EVA we had to wait in the airlock for five minutes for depressurizing/repressurizing, which was much longer than it seemed, but it was good to cool down. My heart was racing from anticipation, so my Garmin track, thanks to Brian’s watch, showed a high heart rate from the get-go for me. Team Two returned home to a warm, home-cooked meal of arrabiata á la Mars, cooked by Carla and Luís, coupled with garlic cheese bread and Crystal Light. Since I had just got back from the EVA, as well as watching the interior water tank get topped off while the last of the food cooked, I was very hungry. Of course, the food was very delicious, and I ate quite a bit of it. Kiri and I cleaned up after, which involved heating up water in the cooking pots for washing the rest of the dishes.